Bus from Malacca to Temerloh is the easiest and smoothest way to travel from Malacca to Temerloh. Many locals prefer this bus service because direct bus service from Malacca to Temerloh, Pahang second largest city after Kuantan, is much more convenient. By taking direct bus from Malacca to Temerloh, passengers do not have to travel to Kuala Lumpur TBS for getting bus to Temerloh. Transnasional is the one and only bus operator offering bus from Malacca to Temerloh. All the Transnasional buses are equipped with air conditioning, spacious leg room and reclining seats which can be adjusted as needed. The only one daily trip from Malacca to Temerloh offered by Transnasional is at 3.30pm. With the only 1 daily trip, passengers are advised to book ticket online advance to avoid disappointment. Else passengers are required to travel to KL TBS to transfer bus to Temerloh. The departure point in Malacca is located at Melaka Sentral Bus Terminal. Passengers can easily access to Melaka Sentral Bus Terminal via taxi or intercity bus. The arrival point in Temerloh is located at Terminal Utama Temerloh. The bus fare for this route service is charged for adult price RM 18.00 and child price RM 13.50. Duration required for bus from Malacca to Temerloh is approximately 4 hours, depending on the traffic and weather conditions on the travelling day. Washroom break will be given upon request from the driver during the journey. BusOnlineTicket.com is the most user-friendly and secure online ticketing portal in Malaysia and Singapore. 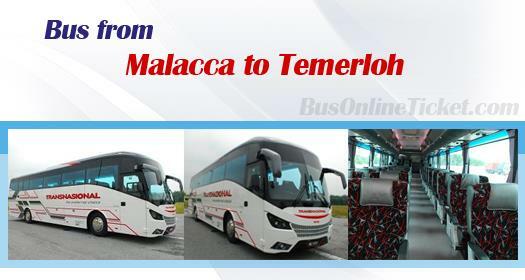 Book your bus ticket from Malacca to Temerloh with BusOnlineTicket.com now to avoid disappointment. We accept various payment method such as Visa, Mastercard, eNets, Paypal, Alipay and many more payment methods to bring you great convenience.